The Newest Suzuki Dealership Opens Its Gates at Sopron’s Iniciál Autóház Kft. Iniciál Autóház Kft. 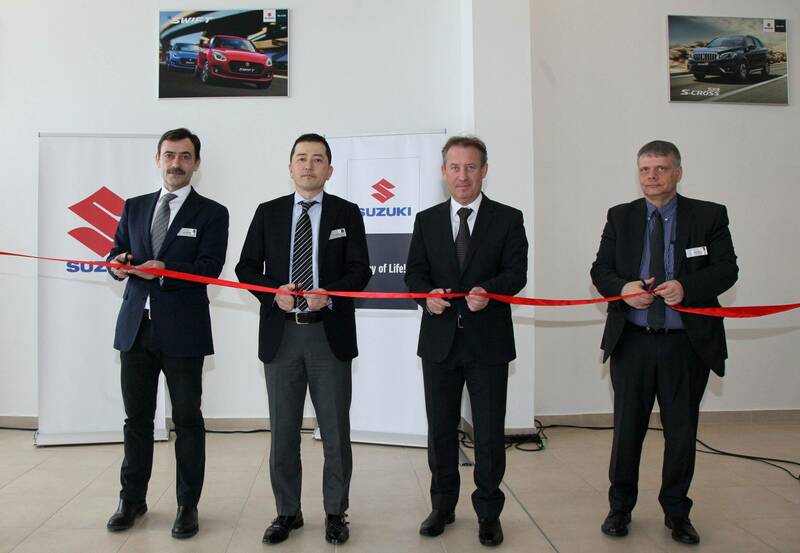 which is already present in 4 cities in the Transdanubia region opened its first Suzuki dealership. The new showroom in Sopron welcomes new and existing customers with a complete range of Suzuki models and a wide offering of services. Already firmly on the top of the 2018 new car sales charts, Suzuki is expanding its extensive domestic network in the Western Hungarian region with the new Sopron showroom. For the last 15 years, Iniciál Autóház Kft. has been one of the major regional dealerships in the Western parts of the Transdanubia region. The showrooms in Győr, Mosonmagyaróvár, Szombathely, and Sopron handle the sale and complete professional maintenance of a wide selection of brands. As a next step of portfolio building started in 2015, the Sopron showroom of Iniciál was expanded this February with the addition of a Suzuki dealership. “We are longtime admirers of the self-consistent and dedicated approach that Suzuki demonstrates in reaching its goals on the domestic market. Therefore, it is a great honor and opportunity for us to become a member of the Suzuki family,” said the Managing Director of Iniciál Autóház Kft., Mr. Zsolt Taródy at the dealership’s opening ceremony and added that this event and expansion was a dream coming true and he expected a significant increase in profit. As part of the official ceremony, Mr. Taródy joined Operating Directors Mr. Jun Mitsubori and Mr. Róbert Krisztián and Sales Director Mr. Péter Tóth of Magyar Suzuki Corporation to cut the tape together marking the opening of the dealership. 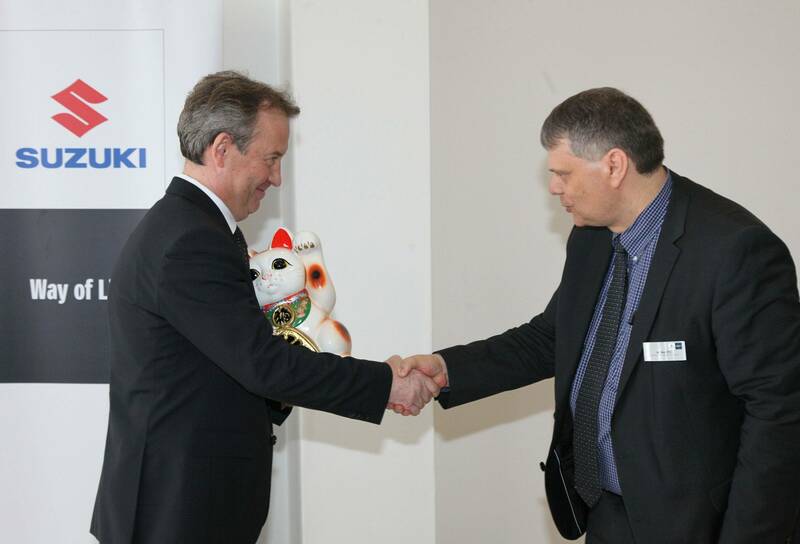 This was followed by Mr. Tóth handing over a maneki-neko, a porcelain lucky cat to Mr. Taródy, as is customary in Japan. Japanese tradition followed closely by Suzuki holds that the cat beckons guests with its left paw to invite them in, and also brings good luck, fortune and health to your home. Through Iniciál Suzuki further strengthens its presence in the Western part of the Hungary. One of the factors behind this significant expansion is the fact that Suzuki’s pole position in new-car sales is unchallenged on the domestic market. Last year, Suzuki confidently led the market with its market share of 13.04% and 15,161 models sold—closing the year as the most popular brand in Hungary based on sales volumes. And this success seems to continue in 2018. “According to new car sale statistics, as many as 1,281 Suzukis were registered in Hungary this January, which equals to a rise of 5.27 percentage points compared to last year’s results from the same month. This indicates that we have taken the lead not only in the passenger car market, but also in the entire vehicle market (including light commercial vehicles),” said Mr. Róbert Krisztián, Operating Director of Magyar Suzuki Corporation. “We are very proud of the fact that our most popular model is the Vitara made in our Esztergom factory. We have a growing number of models now competing not only in the category of small cars, but in the SUV and the compact categories as well. Our sales figures clearly show that Vitara has remained our customers’ most popular choice, and we hope that our other domestic flagship car, the S-CROSS, which was renewed in 2016, will also prove to be very popular”, added Mr. Róbert Krisztián. Iniciál’s new Suzuki dealership welcomes new and existing customers with a complete range of Suzuki models, and a wide offering of maintenance and repair services. For further information, please visit the dealership’s website.